The EFI, or Extensible Firmware Interface, is designed to be an update to the current BIOS technology that is now over 20 years old. As it stands, the BIOS (Basic Input/Output System) is the first thing that runs when a PC is switched on – it sets up and regulates the hardware connected in a series of registers, managing pre-boot data flow between the computer’s operating system and attached hardware. The EFI is an updated software solution that will maintain interoperability but also optimise the BIOS structure, as well as significantly improving the look, feel and features of the existing BIOS. It supports all manner of new features like, graphical menus, the use of the mouse, access to a network and Internet, multiple language options and even "pre-OS" applications like games, media players and Internet browsers. 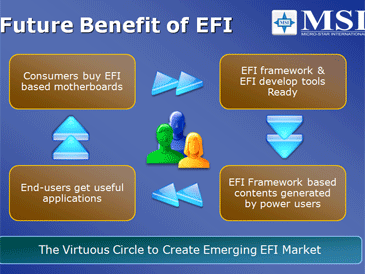 We've followed EFI pretty closely since we first heard about it, with Intel talking about the technology on a few occasions at previous Intel Developer Forums. 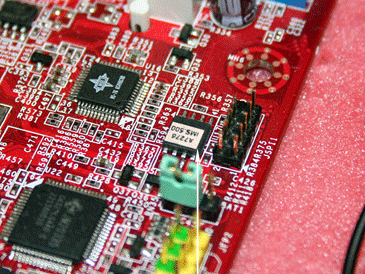 However, it's not until now that motherboard manufacturers have finally started gearing up for its introduction. The last time we saw it we had bumped into American Megatrends, or AMI – a popular BIOS manufacturer, at last spring’s Intel Developer Forum in Beijing, China. It demonstrated its EFI solution on yet another MSI motherboard and, even a year ago, AMI was keen to ramp up EFI products because, let’s face it, there’s not really much you can do to a BIOS year on year to reinvent your sales model. The current (and final) revision of the EFI specification is version 1.10, with the whole thing is overseen by the UEFI Forum. Currently there are a few EFI solutions already out there – the server arena, where *nix is more prevalent, has been using it since 2000 and when Apple jumped aboard the Intel boat in 2006, it start using EFI with OSX. However, it’s worth remembering that these machines are pre-built solutions rather than the more enthusiast-orientated DIY home build we're used to. 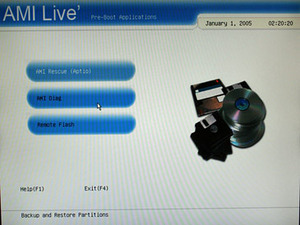 Microsoft's 64-bit versions of Windows Server 2003 and Windows Server 2008 also support EFI, and come Service Pack 1 for Windows Vista x64, consumers can use motherboards with EFI BIOSs. 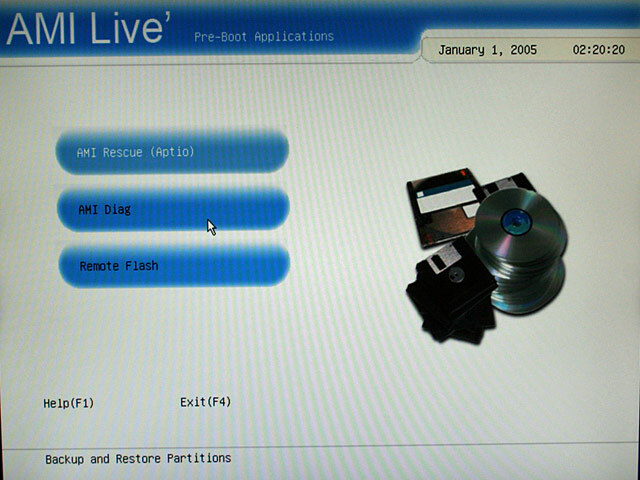 Sadly, there’s a few downsides here – the first is that there will be no 32-bit support. The second is that, once an OS is installed on either an EFI BIOS or basic BIOS, you cannot convert to use the other without a complete reinstall from scratch. This basically puts the brakes on mainstream adoption, as most of us are still running 32-bit versions of Windows, and even if we were to use an EFI-enabled motherboard with Windows Vista x64, it would need to have Service Pack 1 streamlined into the installer – that’s quite a laboursome task for most of us. Unless there is a significant benefit to overclockability and features, I can’t help but think that most of if not all of us can live with the conventional BIOS for a little while longer. The universal positive is that boot times should be improved because the system configuration is optimised under EFI and is now stored in a single file. It's a simple chicken and egg situation – without consumer adoption, there is little point investing in EFI, so the boards remain expensive and the options remain limited. Should the adoption reach a critical mass however—given the fact that EFI is highly customisable because it's based around C/C++: a commonly known and high level programming language—it means there will likely be more effort in feature development by manufacturers and even end users. As always seems to be the case in this industry – competition breeds innovation. 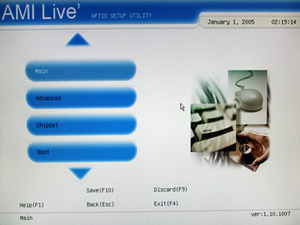 This is a similar to how DeviceVM is trying to sell Splashtop, and while that technology can work with any system regardless of BIOS type, it doesn't have the intrinsic capability of EFI and its adoption level is currently a long way from anything that could be quantified as critical mass. 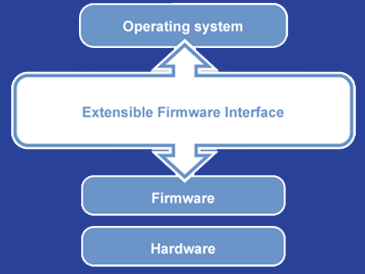 Graphical approach to UEFI development. Flaw can be triggered in Windows, it seems.